The association between eating out and getting a treat is deep--and hard to ignore or break. So don't try. Cook in instead! I can relate. As a kid, we got to feast on pancakes at IHOP on Sunday morning if we successfully suffered through church services. What quickly formed was a deep association between eating out and total treat-dom. When I could finally afford to go out as a young adult, that association was always front and center. Eating out had to involve a dish with lots of cheese and/or cream. and surprise, cooking is a lot of fun, especially when everyone joins in the kitchen and no one tries to be a perfect hostess hero. 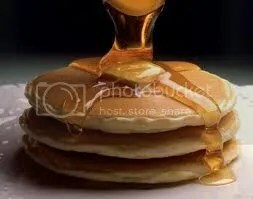 When I was a kid, it was fine to feast on pancakes when we were good enough at church to earn that treat, because that didn’t happen very often! But face it, in today’s world, we eat out a lot more than this, in fact, way too often to justify treating ourselves to comfort foods every time. Maybe there will come a day when you can eat out and stick with one of the healthful options at a restaurant. That will be great. But for now, go easy on yourself and cook your own good, wholesome food that tastes just the way you like it. When: 5 Wednesdays, Oct. 12 to Nov. 9 6:00 to 8:00 pm. ** From “Americans Talk Healthy but Then Eat Their Words,” Christina Rexrode for the Associated Press, The Denver Post, October 3, 2011, p. 1A.